Congratulations! You have secured a seat at our popular and now sold out Fall Native Garden Workshop this Saturday. We are excited about this comprehensive “Create a California Native Garden” speaker lineup and hope you will leave the Workshop ready to set up your garden (maybe equipped with some plants, too!). If you have purchased more than one ticket and the other person is not planning to travel with you to the Workshop, please share this link or information with them. We do not have their email to send this to them. Please read below for some ESSENTIAL information about Parking and the Workshop itself. Important: Please arrive at least 30 to 40 minutes before the start of workshop to give yourself ample time to park, walk to Workshop, pick up name badge, and enjoy coffee and muffins before the first speaker begins. PARKING & OTHER TRANSPORTATION PLEASE READ THIS IN ADVANCE! There are a lot of details listed here for parking. Please read as closely as possible so that you know what to expect. All parking will be roughly a 10 to 12-minute walk to the workshop. Please note that there is no parking available at the physical address of the Workshop. Here are the options, with Street Parking having the easiest walk. 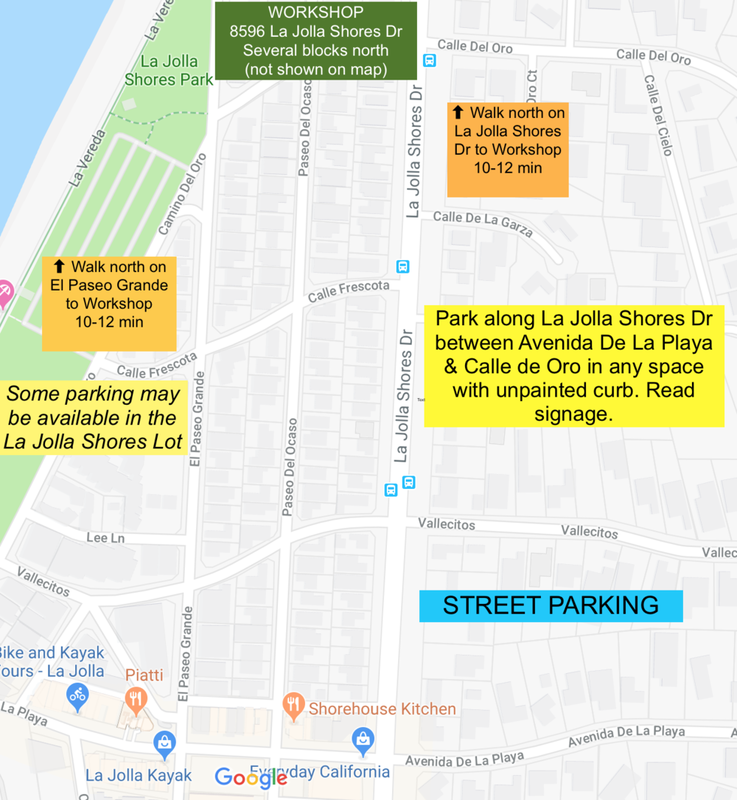 Street Parking (map download): There are quite a few spaces on Saturday morning directly on La Jolla Shores Drive, both sides of the street between Avenida de La Playa and Calle de Oro. Look for unpainted curbs and read signage for limitations. If you are able to find a spot, just park and walk straight north on La Jolla Shores Drive to Workshop (Sumner Auditorium, 8596 La Jolla Shores Drive). This is a very slightly graded but easy walk. If you park on the east side, please cross LJSD at a light. There is also some very limited street parking on the EAST side of La Jolla Shores Drive just north of the Workshop location. Campus Parking (map download): Campus parking is at a premium. However, we have secured a number of parking permits that we will offer to you free of charge. Parking will be at Lot 14. Turn onto Shellback Way off of La Jolla Shores Drive and you will drive directly into Lot 14. An attendant will be there to give you a permit between 7:45 am and 10:00 am. 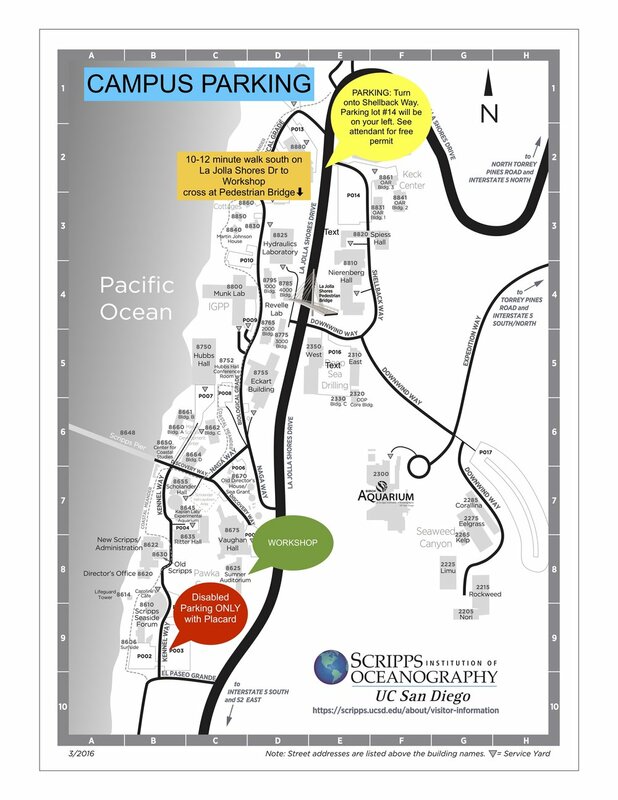 After parking, walk south, crossing La Jolla Shores Dr. at the Pedestrian Bridge to avoid speeding traffic on LJSD. The attendant will direct you. It will be a 10 to 12-minute walk to the Workshop downhill (uphill on the way back, though). Disabled Parking (shown on Campus Parking map). Lots 1, 2, & 3 with placard ONLY. There is a ramp leading to the Workshop from the NE side of Lot 3. · At any other campus lot than the ones we have directed you to. They are all restricted and cars are ticketed and/or towed regularly. · In Lots 1, 2, & 3 without disabled placard. There are time limits on this lot and you will not find a space to re-park later. · On the West side of La Jolla Shores Drive north of El Paseo Grande. These spots are a 1-hour limit on Saturdays. If you plan to arrive after 10am, please call us at (619) 800-0898 or (619) 277-1490. We can let you know if there is still available lot parking. We strongly encourage carpooling. If you want to avoid 30 minutes of parking and walking (maybe uphill) entirely we also strongly recommend ridesharing if that is an option. Do give yourself time, however, to arrive and check in. We ask that drivers pull onto El Paseo Grande, the cross street just south of Sumner Auditorium, to discharge passengers. ● REGISTRATION/CHECK-IN and coffee and muffins is from 8:15-9:00 am. Our first speaker will begin promptly at 9:00 am. At check-in simply present your nameand we will have a name badge ready for you. ● Our famous SEEDS AND BOOKS tables will be filled with items available for purchase during registration, break times and lunch. ● A wonderful selection of CALIFORNIA NATIVE PLANTS from renowned nurseries Moosa Creek & Tree of Life will be available for purchase during registration, break times, lunch until 1pm. ● This is a sustainable event. Please bring a REFILLABLE WATER BOTTLE. ● LUNCH will be 12:00-1:00 We will have a large assortment of university-catered box lunches with chicken, turkey, and caprese (vegetarian) sandwich options. If you have requested the vegan/gluten-friendly option during registration, these lunches will be at a separate table and labeled with your name. ● The SCHEDULE is attached so you can get acquainted with the flow of the day.